At Google’s annual developer conference this week, Google I/O 2017 (May 17-19), the company revealed plans to bring augmented reality (AR) to its immersive education platform Google Expeditions. The upcoming Expeditions AR mode harnesses Google’s Tango AR platform, which uses Visual Positioning Service (VPS) technology to map indoor locations. With a Tango-compatible device, such as the Lenovo Phab 2 Pro, the camera will utilize VPS to recognize specific objects and landmarks. Expeditions AR will enable students to see 3D models of objects like volcanoes, DNA molecules and more up close in a virtual environment. Expeditions AR lessons will be available to schools this fall through a Pioneer Program. Interested teachers, administrators and other individuals can sign up now. 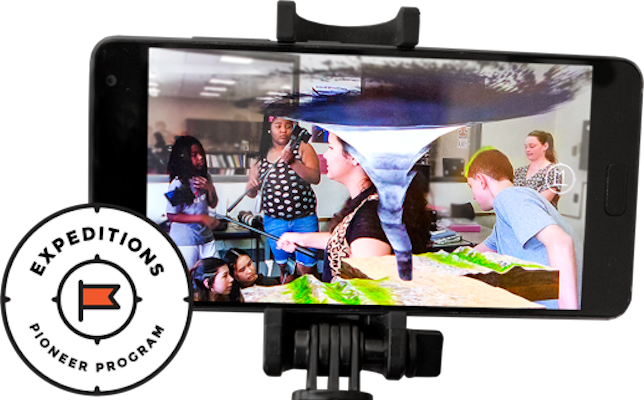 Just two years ago at I/O, the company unveiled Google Expeditions for the 2015-16 school year as part of an effort to bring low-cost, virtual field trips to the classroom. The company said that more than 2 million students worldwide have experienced virtual reality in Expeditions with Google Cardboard. To see how Expeditions AR could be used in the classroom, watch the video below.